I’ve never liked combining black with certain colors. For example, yellow or blue, but as time goes on I am learning ways to incorporate these shades that I normally stay away from. A good way to mix blue with black is to use a lighter shade. 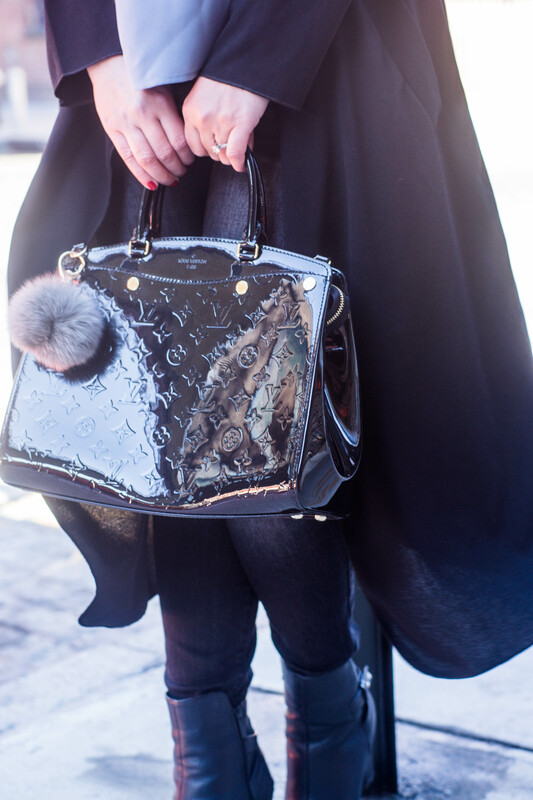 Not only does it contrast great against black but it really makes the outfit pop. How adorable is this vest? 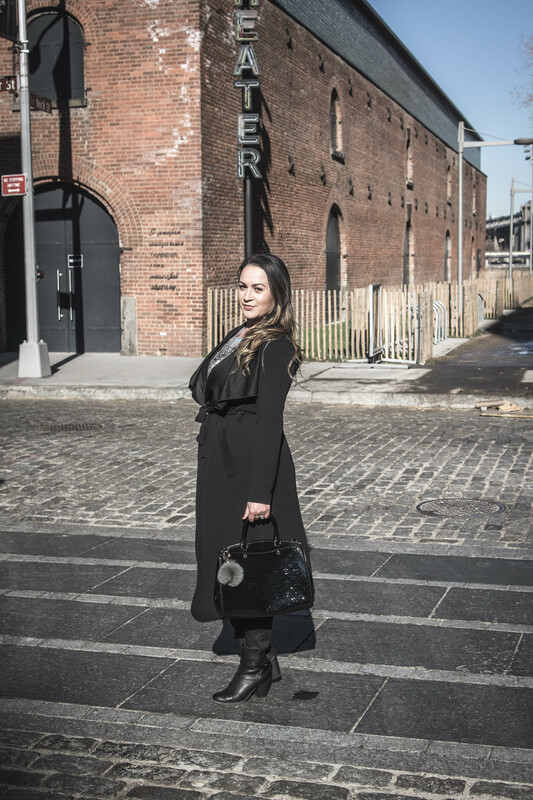 My favorite color is black and I wear it daily so I love being able to throw on a strong print to accent my outfit. You can instantly turn a boring and dull outfit into something that pops with color or a print. This vest is from ShopSosie.com and is still available in a few sizes, so get it while you can! As you can see, my obsession with long sleeveless vest continues. I really love this look because its so simple yet you can throw on heeled boots and a red lip and it really jazzes the look up. Plaid + Fringe are two fashion trends that have been in for quite some time now. If you follow my instagram (@pearls_and_paris) you have seen this fringe bag multiple times. It’s my go to bag! It’s super chic and can be worn casually or for a night out which I love. While #allblackeverything is my fashion motto, I see myself leaning even more towards it since having my son 3 months ago. 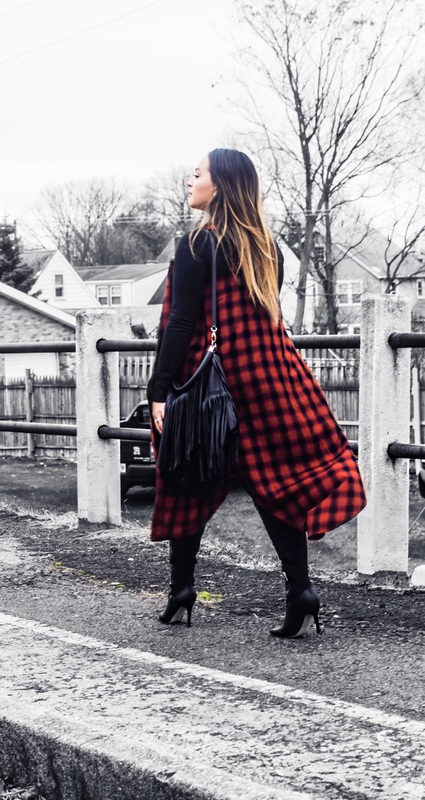 Black obviously is very slimming but it also creates a very clean silhouette when wearing a statement piece such as this sleeveless long red plaid duster. I pulled the look together with these gorgeous over the knee boots which has the perfect heel height when on the go. I cannot remember the last time I was able to style some pieces then go out and shoot them for Pearls & Paris. It literally has been FOREVER, therefore it felt great to get back out there. One of my best friends has picked up photography and she has a great eye so it was a pleasure to have her shoot me. I absolutely believe that Leopard is a neutral. It’s a staple print to have in your wardrobe and it blends well with so many shades and colors. I splurged on these Coach booties because they were truly love at first sight. Once they went on sale, I didn’t think twice about purchasing them. This chunky heel is not only super comfortable but very trendy this season. I’m looking forward to styling these with some fun colors in the upcoming months. 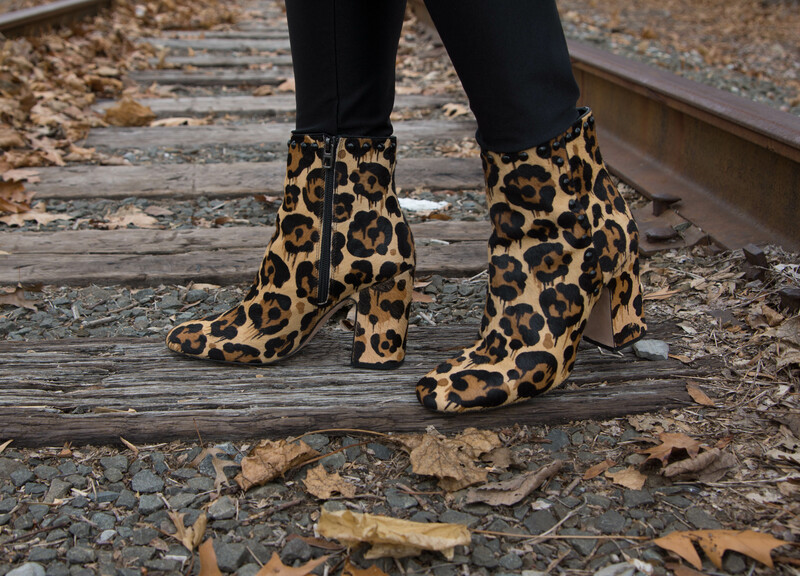 Unfortunately, these Felicia booties in leopard have sold out BUT if you like the style and shape, they are still available in black. 1. Bliss Citrus Stars bath + body / $10 – This cute little duo includes a 1 oz lemon + sage body butter as well as 1 oz of the lemon + sage soapy suds. This mini set is perfect for travel and will leave your skin soft and your spirits bright. 2. Sophia phone case by Jovan Rosario / $35 – I’m in love with the sketches by Jovan Rosario (a.k.a @Ponyy_Boyy) He recently launched his website and has some amazing products with his original sketches on them. This sketch is one of my favorites. ‘Sophia’ is ultra chic and is sure to be a stocking stuffer favorite. 3. Eye Roll Mug by Greeving Cards / $12 – Greeving Cards puts out products with witty statements and honest points of view. From cards to apparel to drinkware – they have something for everyone on your Christmas list that doesn’t take themselves too seriously. This mug sums up how most people feel in the morning.. therefore, buy one and gift it to the eye roll queen in your family. 4. Nila Anthony Faux Fur Pom / $15 – Key chain pom poms have been an “It” item the last few months! They are cute, super fun and bring a pop of color to your handbag of choice. 5. OPI Nail Polish / $9 – I have a sick obsession with nail polish therefore a few bottles tossed into my Christmas Stocking always puts a smile on my face. OPI is my go to brand. The formula is great and long lasting and they always have the best shades. Check out the Starlight Collection as it combines very rich, glittered jewel tones. 7. Peter Thomas Roth travel sized masks / $5 – I’m obsessed with these masks! Skin care is really important to me and the Peter Thomas Roth products are made with amazing ingredients to help keep your skin looking fresh year round. These travel size pots are perfect stocking stuffers. Shown here are the Rose Stem Cell, Pumpkin Enzyme & Irish Moor Mud Masks. 8. Gearonic USB Battery Charger / $7 – There aren’t many things worse then seeing the little battery on your cell phone screen turn red! This portable charger is small and can can fully charge your phone two times. This is a must for the lady or gentleman in your life that is on the go. 9. Fossil Bradley Slim Wallet / $30 – This sleek leather wallet minimizes the bulge in your pocket and holds all your essential cards and features a handy money clip for cash. 10. Stainless Steel Bottle Opener Cufflinks / $50 – These cufflinks are functionable yet FUN! A great gift for dads, friends, and groomsmen – these sleek and discreet accents keep fellas looking professional from 9 to 5 before they really get down to business after work gets out. 11. Ghirardelli Chocolates / $8+ – You can never go wrong with chocolate… ever! 12. Old Navy Fair Isle Scarf / $10 – Winter accessories are the perfect stocking stuffer. This sweater scarf is soft and warm and can be worn on the go or jazzed up for a night out. 13. Fujifilm Instax Mini 8 / $100 – This is such a hot item this year. It has a cute and compact body design for instant photos & instant fun! 14. Textured Diamond Socks by The Tie Bar / $8 – Socks! 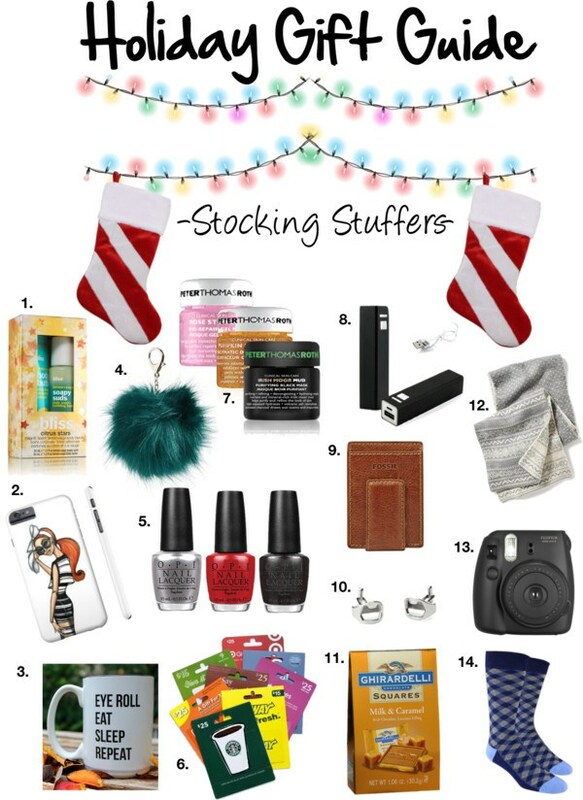 Another stocking stuffer favorite that you can’t go wrong with. 1. Ralph Lauren Romance / $88 – This is my go to fragrance! It’s a very feminine, light and floral scent that is long-lasting. I think perfume can be tricky sometimes since every woman favors different notes but Ralph Lauren Romance is one of those scents that works for everyone. 2. Reversible Faux-Leather Tote / $34 – This is currently my favorite on the go bag. It’s large enough to hold everything you need for the day without being obnoxious. It comes in handy when you have a long day out. It fits all my necessities for the day including my makeup bag and a pair of flats or heels to change into while still being really chic. I have also used it as a cute diaper bag when heading out for the day with my son. It’s available in Bluetiful, Cognac Brown (shown) & Rose Gold. 3. Places to go, People to see Coffee Table Book by Kate Spade / $40 – I’m a sucker for a fabulous coffee table book… I’m also the biggest wanderlust you’ll meet. Combine those two and you have this book by Kate Spade. From inspirational quotes and travel wisdom to old world glam photography – this book has it all. 4. Henri Bendel Party Girls Mug / $25 – The Party Girls Mug is an essential addition for all fellow coffee & tea lovers. Featuring a custom Izak illustration and Henri’s signature on the handle, this porcelain mug is a chic and charming. 5. Givenchy Jewelry / $25+ – While browsing in Macy’s a few months back, I stumbled upon a case filled with Givenchy jewels and was blown away. I did not know that this luxurious brand started to make more affordable, yet equally as stunning, jewelry. The stones used as well as the quality of all the pieces are top notch. Three of my favorite pieces are the Teardrop earrings, Crystal Bangle Bracelet and this stunning Cluster statement necklace. 6. Madden Girl Lolaaa Over-the-Knee Dress Boots / $99 – Over the Knee boots are this seasons Must Have item. I really love these because the lace up back really makes them stand out. They are made from stretch microsuede and have gold-tone accents. 7. H&M Textured Weaved Cape / $35 – Capes! I have an obsession with them. Capes have been hot for some time now. The reason why I love this one so much is because I feel like it is very flattering on all body types. Many others can make you look very boxy but this one flows perfectly. 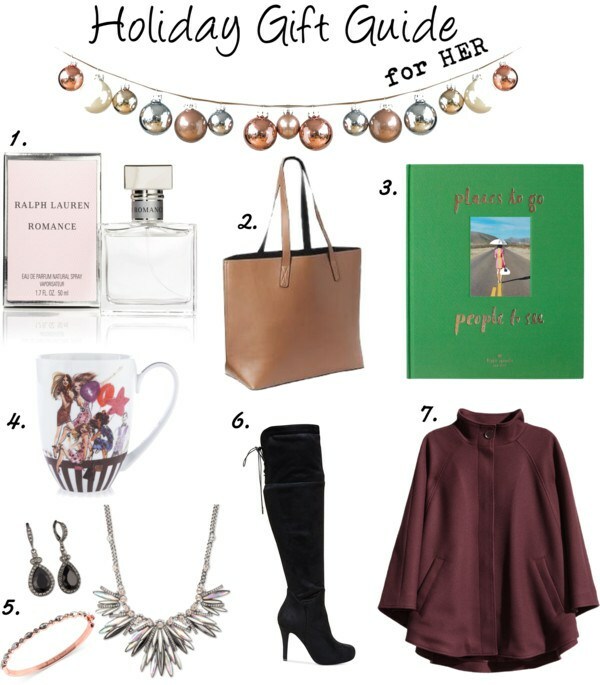 Capes can be worn during any season and can be dressed up or worn casually making this a perfect present under the tree.